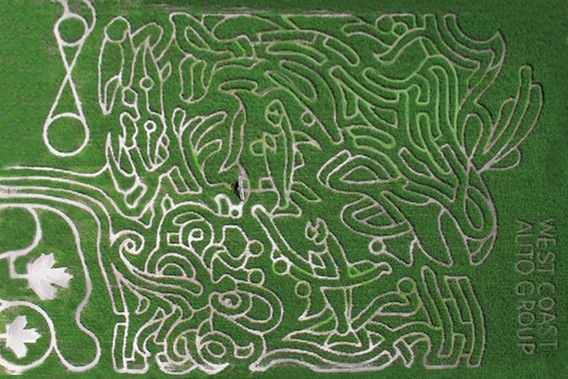 With 6.3KM of trails, the corn maze at Meadows Maze is one of the largest corn mazes in the world. People of all ages have been going there every year to test their navigational and map reading skills. 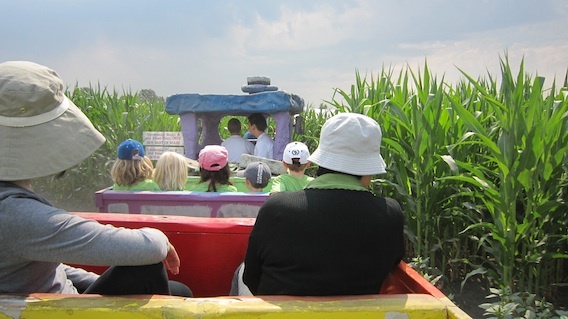 More that just a maze, other attractions include a Petting Zoo, Bee Observatory, Lions “Goat” Bridge, hay wagon rides, full concession and Cranberry Meadows Country store.You can also take a slide down Meadows Mountain or take a dusty ride through the maze on the Barrel Train or Corny’s Maze Train. 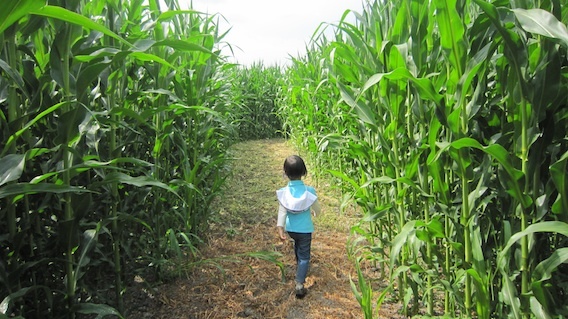 Hopcott Farms, the maze operator, creates a new maze in the corn field every year. The 2010 maze celebrates 100 years of fun at the PNE. When you look at the maze from the sky (or Google Maps), it looks soemthing like this. However, from the ground, it looks like a giant corn field with a bunch of endless trails going off in every direction. The object is to go into the maze, locate a bunch of checkpoints and then find your way out. If you try doing it without reading the map, you’ll be stuck in there for hours, wondering aimlessly until you go crazy and get eaten by the crows. I had planned to hit the maze yesterday but then discovered that yesterday was a holiday (BC Day). I don’t like going to public attractions on weekends or holidays because there’s normally too many people and I hate waiting in line. So, I decided to go today, which is not holiday and we had the entire maze pretty much all to ourselves. You got to love the Dot Com Lifestyle! 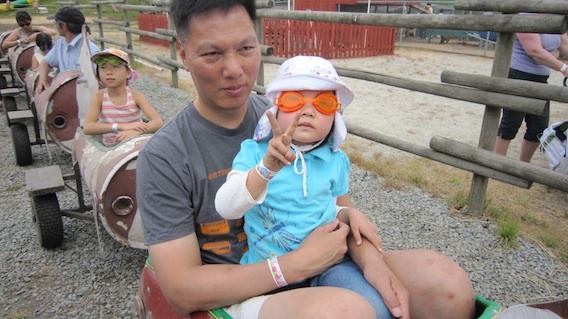 Meadows Maze is located at 13672 Reichenbach Road in Pitt Meadows, BC. If you have a plane and you want to see the maze from the air, the latitude is 49.250573 and the longitude is 122.710530. You can punch this into Google Maps but the satellite view is showing the maze from 2008.